If you haven’t done so already, watch the video above to see how to make this rich and delicious pimento mac and cheese and then come back to reading. Watched the video? Great, now we don’t need to convince you to try this gourmet mac and cheese recipe – the video is all the persuasion you need! Just gather your ingredients and get cooking so you can dig into this creative twist on traditional mac and cheese. Then, be sure to share the recipe with your friends and family on Facebook, Pinterest, Twitter and Instagram. To make 8 servings of this gourmet mac and cheese dish, start by preheating your oven to 350°F. Spray 6 individual baking dishes or a 9x13 baking dish with nonstick spray. Melt CabotSalted Butter over medium heat in a large pan. Whisk flour into the melted butter until combined. Continue whisking constantly for 2 minutes. Slowly add milk and whisk until flour mixture has thickened. Add 1 cup of Cabot’s recipe for theBest Pimento Cheese, as well as the smoked paprika, salt and pepper. Remove from the heat and whisk until cheese is melted. Stir the cooked pasta into the sauce and divide the mixture between 6 individual baking dishes (or pour into a 9x13 baking dish). Top with the remaining 1½ cups of Cabot’s Best Pimento Cheese and bake for 25-30 minutes until bubbly and the topping is melted. When you’re in the mood for a mac and cheese recipe that’s loaded with delicious veggies, look no further than our Roasted Veggie Mac and Cheese. You’ll love it! As a co-operative of over 1,000 farm families, Cabot is dedicated to working hard to ensure that all of our dairy products are made using high quality ingredients. 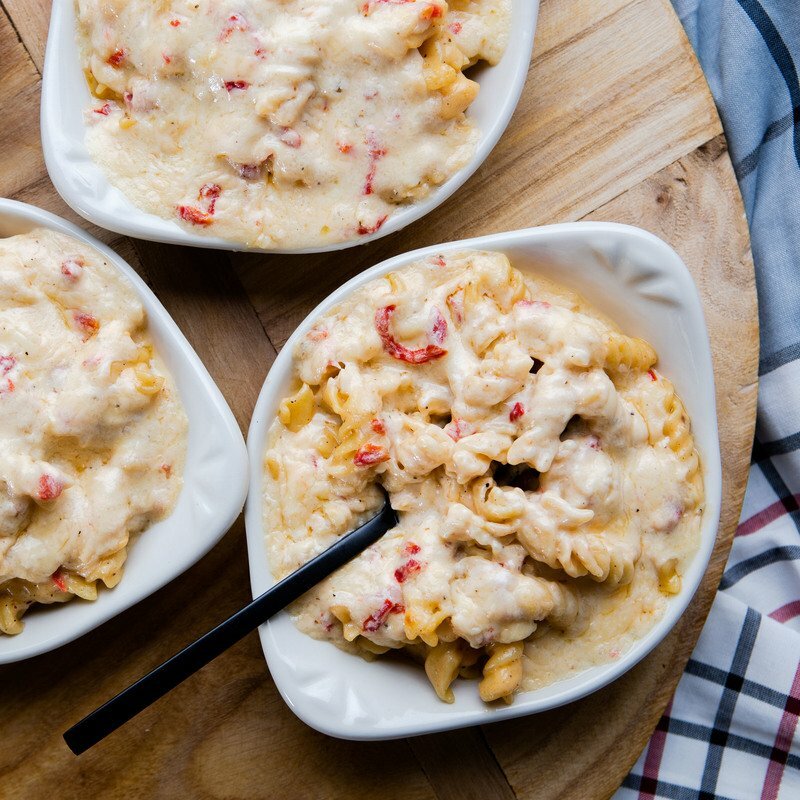 We’re confident that you and your family will love our spicy mac and cheese recipe, but we’d love to hear your feedback after you try it, so please consider rating and reviewing it. PREHEAT oven to 350°F and spray 6 individual baking dishes or a 9x13 baking dish with nonstick spray. MELT butter over medium heat in a large pan. Whisk flour into the melted butter until combined. Continue whisking constantly for 2 minutes. ADD milk slowly and whisk until flour mixture has thickened. Add 1 cup of the pimento cheese, smoked paprika, salt and pepper. Remove from the heat and whisk until cheese is melted. STIR the cooked pasta into the sauce. DIVIDE the mixture between 6 individual baking dishes or pour into a 9x13 baking dish. Top with the remaining 1½ cups Best Pimento Cheese and bake for 25-30 minutes until bubbly and the topping is melted.